One of the most profitable ways of turning your blog into a business is creating and selling an online course. In this guide, we’re going to show you how to setup an online course using WordPress for free and create a profitable income stream from your blog. Many bloggers like Pat Flynn and Yaro Starak managed to make hundreds of thousands of dollars by simply selling online courses from their blogs. If you also have knowledge or experience in a specific topic, you can create a course to share that knowledge while also turning your blog into a passive income source. While it may sound like a complicating process, setting up an online course with WordPress is actually quite easy and free!. We’ll show you how it’s done. Usually, you have to use an online LMS (Learning Management System) platform to create and sell your courses as well as manage your students. But these platforms come with expensive monthly subscriptions and platforms fees. When using WordPress, you can avoid monthly subscription fees and platform fees to provide a smooth online learning experience to your students without a hassle. 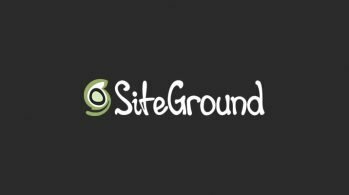 There are many great WordPress LMS plugins you can use to get this job done. The premium plugins offer better features and come with one-time prices. If you can’t afford a premium plugin, there are a few free plugins you can consider. If you’re on a tight budget, go with a free option. 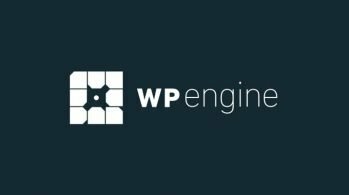 There are a handful of free LMS plugins available on WordPress. However, most of them are either outdated or offer poor features. These plugins are the best free options available at the moment. LearnPress is the most popular, free, stable, and probably the only free LMS plugin that gets updated regularly. It also comes with a beautiful design and even gives you the ability to use themes to customize the design of your courses to offer a better experience to your students. It lets you create text, video, and quiz based courses with PayPal integration. Stripe and 2Checkout integration are available with Add-Ons. LifterLMS is a newer WordPress LMS plugin that also features a modern design and lots of customization options for creating an effective online learning platform. This plugin also provides you with the ability to extend its functions with premium add-ons. MasterStudy LMS is another great free plugin you can use to setup a learning management system in WordPress. This plugin allows you to create text, video, and slideshow based learning programs and offers integration with PayPal and Stripe for accepting payments. CoursePress is a free LMS plugin that’s most suitable for schools and colleges. It lets you create unlimited courses with automated assessments, reporting, grading, and other useful features. 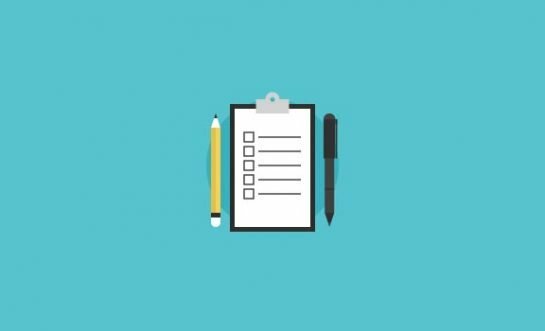 Before getting started on setting up the learning management system, make sure that you have a fully prepared content plan for your online course. Creating an online course is not the same as creating a blog post. Online courses require careful planning, a composition of the right content, assignments, and flowing lessons that connect with each other. An online course is also something that your students will be carefully studying over a period of time. Which means each lesson in your course has to be full of informative and entertaining content to keep the students fully engaged throughout the course. We’re going to use LearnPress to setup the learning management system in WordPress. LearnPress has the most beginner-friendly interface and it’s quite easy to set it up. To install LearnPress, simply login to your WordPress admin dashboard and go to Add New plugin page. Type LearnPress in the search bar and then click Install and Activate to enable the plugin. Note: While it’s not required, we recommend that you install your LMS plugin in a fresh WordPress installation. 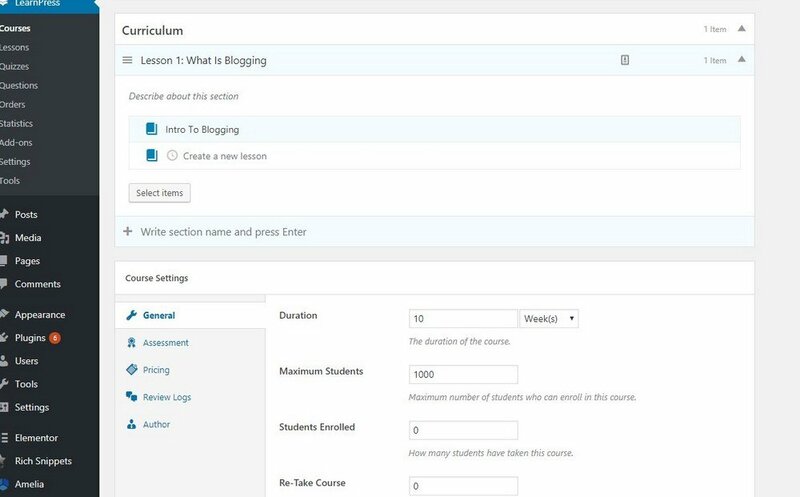 This will make it easier for you to manage your courses, students, and sales while also keeping the blog and course platform separate. 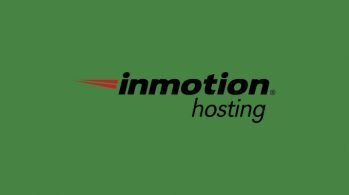 Most WordPress hosting providers have affordable plans that allow you to create multiple websites on the same server. Simply use a subdomain name (eg: school.yourname.com) and setup it up in a fresh installation. After installing and activating LearnPress, the plugin will guide you through the initial setup process with its setup wizard. This is one of the best features of the plugin that makes the whole process simpler to beginners. 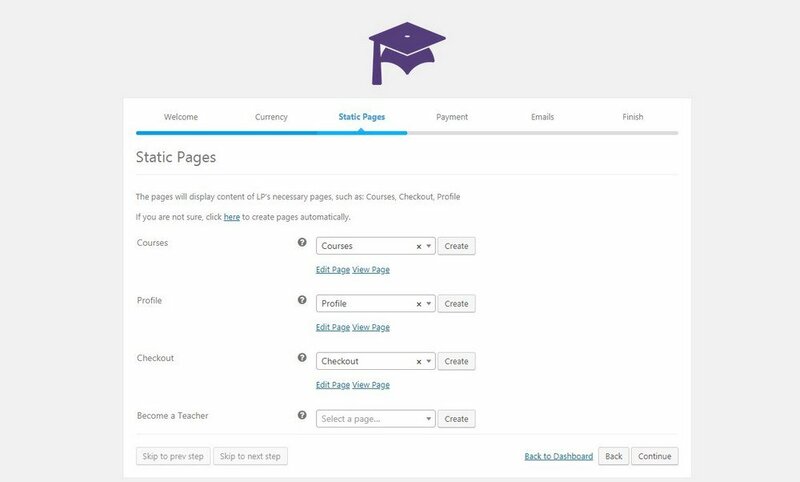 The setup wizard will help you configure your currency, create static pages to your courses, profile, and checkout pages, setup your PayPal for accepting payments and enable email notifications for students and teachers. At the end of the setup wizard, it will prompt you to either install a sample course or create a new one. 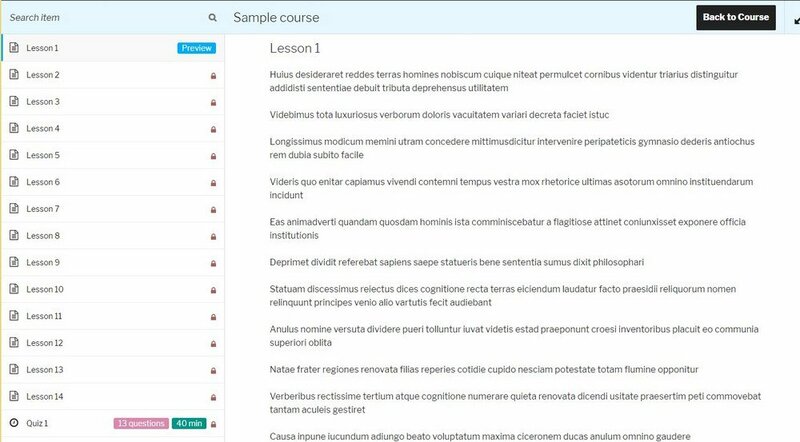 If you want to see what a LearnPress course looks like, install the sample course to see how course content is created with this plugin. Or, let’s create a course from scratch. 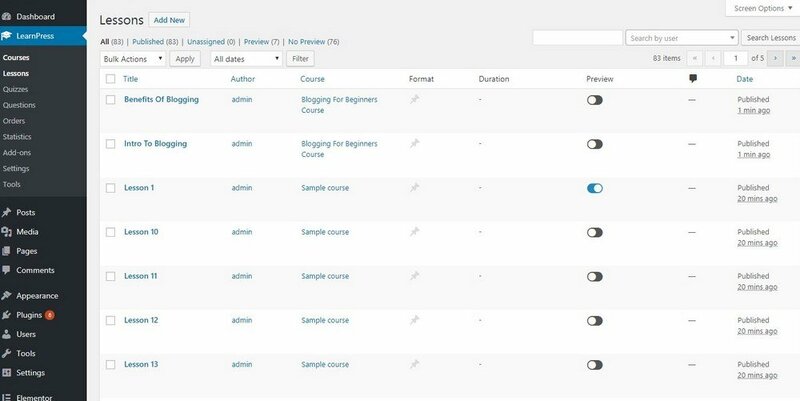 To start creating a new course, go to the LearnPress plugin page by clicking on the link on the WordPress admin dashboard sidebar. Go to the Courses tab and click on Add New. After giving your course a title and a description, you can configure the course. This means describing the course curriculum, setting up the course assessment, pricing, and pricing. 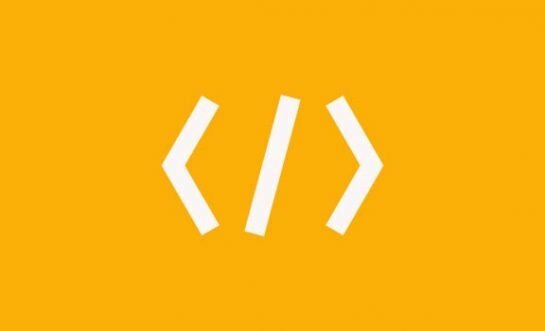 Hit Publish to save the changes. The Lessons of your course needs to be created separately. Switch over to the Lessons tab of LearnPress to create lessons. If you’ve already defined all the lessons in your Course curriculum, then those lessons will already be available on this page. All you have to do is edit them to add your own content. Or you can Add New lessons and assign them to your course. To assign a new lesson to a course, you need to go back to the Courses tab and edit the course to manually add the new lesson into the course curriculum. You can also create and include Quizzes in your course. To create a quiz, you need to first create a quiz from the Quizzes tab and then create the questions individually from the Questions tab and assign them to the right quiz. Then the quiz itself can be assigned to the course curriculum. The final course page will look like this (use a premium theme for prettier course page designs). This page will allow students to browse the course curriculum, preview the lessons in each section, and Enroll in a course directly from the landing page. LearnPress also offers plenty of premium Add-Ons for adding more functions to your LMS. Including various types of course content types, functions, integration with 2Checkout for accepting credit card payments, integration with WooCommerce, and more. Now that you’ve completed creating the course, you can start promoting and selling your course. But, before you start selling, pick up a LearnPress compatible WordPress theme. Your course landing pages and lessons pages will look much more professional and beautiful when using an education WordPress theme that’s been designed optimized for LearnPress. And, finally, remember that people aren’t going to magically appear on your website to buy your course. You need to work hard to promote your course and drive traffic to your course landing page. Use your email list to promote the online course. Connect with other bloggers in your niche and run a guest blogging campaign to promote the course. As you can see, creating an online course and setting up your online learning system is actually the easy part. Promoting the course and getting students is going to be the hard part. But, like with most businesses, you need to work hard to make profits. Since you used free software, you can invest some of the leftover money on an effective advertising campaign or guest blogging campaign to help bring you fast results in recruiting students to your course.